Want a Dermal Piercing in Denver? A dermal piercing is a type of body piercing placed on flat surfaces of the body. It is composed of two elements; a base that sits under the surface of the skin and the stem that sits perpendicular, and flush, to your body. Once the piercing is healed, you can add various attachments by screwing off the top and replacing it with beautiful jewelry. What You Can Do with Dermal Piercings. Outline the curve of your hip. 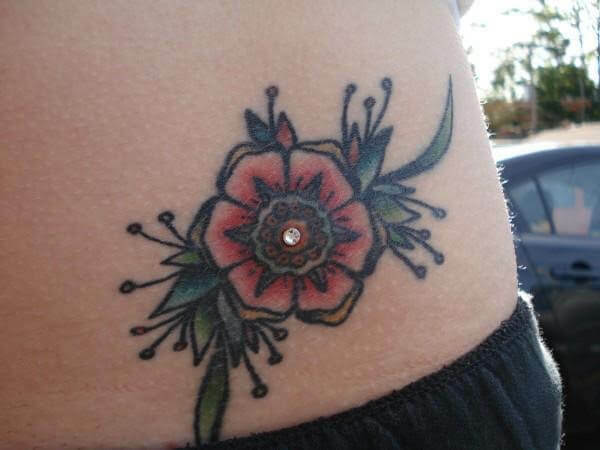 Accent your tattoos with a few sparkly dermal tops. Create unique patterns with multiple dermal piercings. Get a microdermal piercing and a teardrop dermal top inserted below the corner of your eye. Create a necklace around the base of your neck by having an arc of single-point piercings inserted. Only touch it with washed hands. Keep it (and yourself) clean, use products like antibacterial soap. Wear loose, breathable fabric clothing like cotton. Cover your dermal piercings with a breathable bandage before practicing any sport. Pay extra attention when putting clothes on or taking them off so that it doesn’t get irritated. If you are interested in getting a dermal piercing, come to the best tattoo & body piercing shop in Denver, Colorado. At Mantra Tattoo, we have the best piercing artists and quality body piercing jewelry in the area. Schedule an appointment or call us at 303.239.8282.